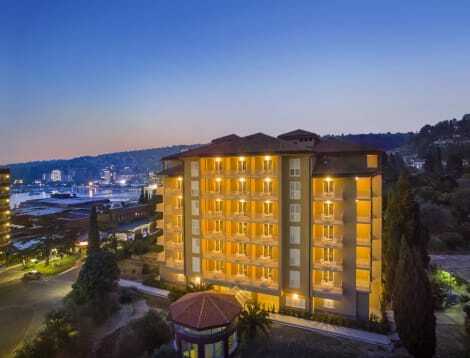 A stay at Grand Hotel Portorož 4* superior - Lifeclass Hotels & Spa places you in the heart of Piran, a 1-minute drive from Portoroz Beach and 8 minutes from Piran Harbour. This 4-star hotel is 2.6 mi (4.1 km) from Tartinijev Trg and 4.7 mi (7.6 km) from Izola Marina. Enjoy a meal at the restaurant or snacks in the hotel's coffee shop/café. Quench your thirst with your favorite drink at the bar/lounge. A complimentary buffet breakfast is included. Pamper yourself with a visit to the spa, which offers massages, body treatments, and facials. After dipping into one of the 2 indoor swimming pools, you can spend some time at the private beach. Additional amenities at this hotel include complimentary wireless Internet access, concierge services, and babysitting/childcare (surcharge). Getting to nearby attractions is a breeze with the area shuttle (surcharge). Enjoy a meal at Barka Restaurant or snacks in the coffee shop/café. The hotel also offers room service (during limited hours). Wrap up your day with a drink at the bar/lounge. A complimentary buffet breakfast is included. When you stay at Boutique Hotel Marita in Piran, you'll be near the beach and 9 minutes by foot from Portoroz Beach. This 4-star hotel is 2.6 mi (4.3 km) from Piran Harbour and 2.9 mi (4.7 km) from Tartinijev Trg. Make yourself at home in one of the 178 air-conditioned rooms featuring LCD televisions. Complimentary wireless Internet access keeps you connected, and satellite programming is available for your entertainment. Private bathrooms with showers feature bidets and hair dryers. Conveniences include phones, as well as safes and desks. Enjoy a meal at the restaurant or snacks in the hotel's coffee shop/café. A complimentary buffet breakfast is included. Featured amenities include dry cleaning/laundry services, multilingual staff, and a safe deposit box at the front desk. Self parking (subject to charges) is available onsite. Head straight for the casino, or wait for that lucky feeling while you enjoy one of the other recreational opportunities, such as a nightclub and outdoor tennis courts. Getting to nearby attractions is a breeze with the area shuttle (surcharge). Make yourself at home in one of the 89 air-conditioned rooms featuring minibars. Complimentary wireless Internet access keeps you connected, and digital programming is available for your entertainment. Private bathrooms with shower/tub combinations feature complimentary toiletries and hair dryers. Conveniences include phones, as well as safes and desks. 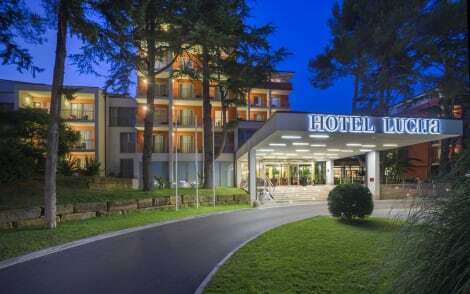 lastminute.com has a fantastic range of hotels in Portoroz, with everything from cheap hotels to luxurious five star accommodation available. We like to live up to our last minute name so remember you can book any one of our excellent Portoroz hotels up until midnight and stay the same night.